That’s a great looking design for the blade Bruno. And I like how the pattern in the steel goes from tight to open and back. This one had my nerves strung tight. First I had 4 holes that were spaced exactly right, relative to each other, and in the middle of the tang. Then I had to sink the circumference holes right over the guide holes, on both sides, to the right depth. And then drill all the way through with a slightly smaller drill while not destroying the ridge inside the hole. There are so many ways this can go wrong it's not funny. Is there someone that make new Tamahagane? There are a couple of people. @Mike Blue is one. Tim Zowada. I know several people in the UK who do so like Owen Bush. Today I took a day off, spent half a day forging, and in the afternoon went into my workshop to finish some in-progress things. I finally got around to etching a couple of razors. And the second is Bob Kramer's Tamahagane, immediately after oiling. I set the rubies right after etching and rinsing because oiling before setting them would probably ruin the glue. A size correct recreation of a shoulderless Sheffield blade. 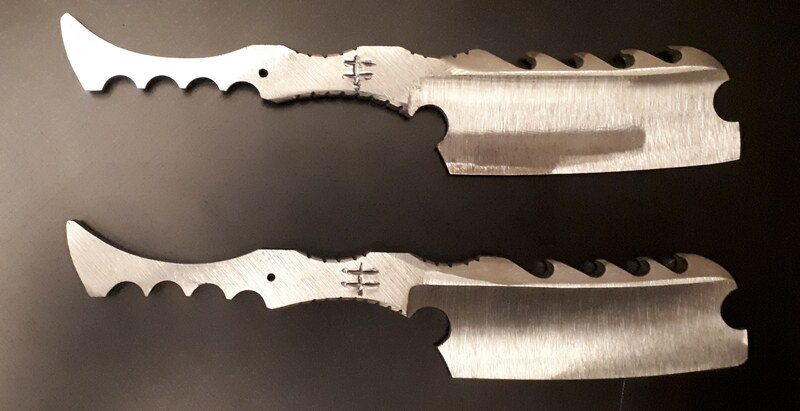 2 Draco Nobilis razors in progress. The rough work is done. These are for a matching set. One is wootz, the other is damascus. The razors are almost exactly the same. There is only a little bit difference in the fins. That is the hardest part. This will be correct some more after heat treatment. Doing that when the steel is hardened, is a bit easier because you have less risk of cutting or filing too deep. nice, you could put knuckles on the tail or would that be to much in a small space ? would your count the fins when meauring the the width? or stop at what would roughly be the spin just before the fins start? No. When it comes to spine width, I measure from the start of the hollow to the edge. For most razors, the difference isn't that important, but with big fins or such on top, it skews the calculations too much if I'd include them. thanks, just was curious if it was standard to include fins in the measurement, but they are going to effect your angle so would they be included or listed in any way other then overall width? great, job. I will take one for the team, and volunteer to test shave them (FYI the post leaving the US is REAAAALY slow) but newer fear you won't get them back right away. Taking one for the team. You a valued member! One of my first baby steps in trying new things with layered steels. Not exactly what I wanted but a good proof of concept to sink into my brain. This is post heat treat. That is very interesting. I hope to be doing some things like this in the near future.